The key to being a great all terrain freeride skier is to know a few secrets of how the body and ski interact to make the ski work for you. We will focus on the three major elements that control a ski, these are Edge, Pressure and Weight Distribution. Get these three right and the sky is your limit. We will also steel some secrets from Snowboarders to help you advance quicker to all mountain all terrain skiing with style and flow. Soon you will know my secrets to becoming an advanced skier with a smile on your face, after all that’s what it’s all about. What’s the point in spending a week, training, working hard ,trying to keep up with your class or even hurting yourself, if it’s not fun! This book is written for all abilities from absolute beginners to advanced and should be read from beginning to end. Each chapter builds on the techniques from the previous one and is vital in order for you to succeed. I would suggest working through this book with one or two friends at home and on the mountain, this way you can make it fun and ski together!! I haven’t met many people that really enjoy their group ski lessons, one of the reasons is that you only spend about 25% of the time actually skiing. By the time you have all gathered, made it to the lift all waited at the top, crawled to somewhere quiet to start, and been talked to for five minuets, there’s not much time for skiing. Then you all snake down the hill wait at the bottom talk again and repeat. What I mean by ‘really’ ski is skiing when you are aware of what you are doing, the problem with following someone else is that you tend to focus on following rather than what your skis are doing. How many times have you got to the bottom of a run and thought, I just totally forgot to do what the instructor said. We’ve all done it! We learn to ski by muscle memory, this is your body remembering the actions of hundreds of muscles in a complex sequence by doing the thing, skiing. If you tried walk and verbally tell each muscle to move you would probably fall over, the same with skiing it has to be an unconscious act or it wont work. The great thing is most of these complex movements we have already learned by walking jumping and running. We just have to learn how to put them together in a little different order. 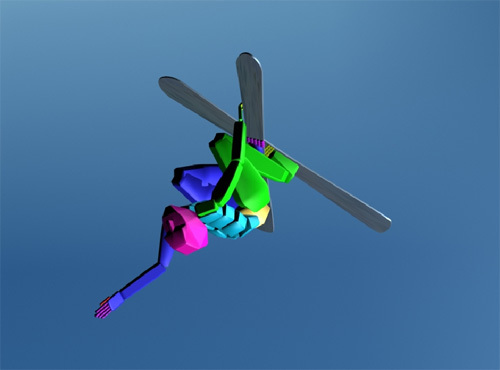 Introducing Bob the biped, throughout this book I will be using Bob to help show you the subtle position changes used for skiing. Sometimes it is difficult to capture exactly what is going on in a photograph, so I hope you enjoy Bobs company. Bob enjoying an quick inverted mute grab on a sunny day off.